Continuous flow through bins give you MAXIMUM productivity! Get plans to build a unit like this from someone I really trust. 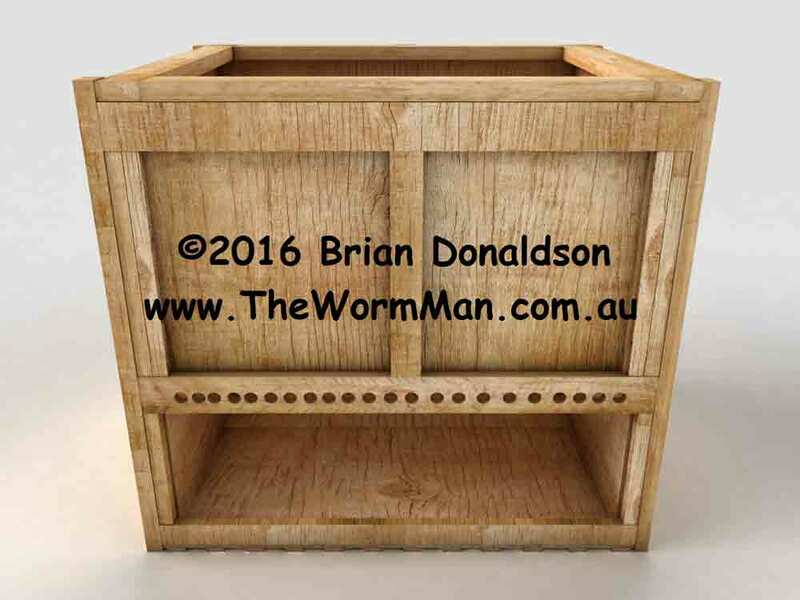 These worm bins are almost like the flow-through worm bins such as the Worm Factory but no bottom. These are extremely low maintenance types of worm systems. They're worm systems that have no bottom to them save for a grid like mesh that holds the worm castings in place or from falling out of the system. These are the best types of worm systems in the industry. They work just like in nature. As mentioned earlier in this guide, composting worms spend their entire life on the surface of the Earth where rich rotting vegetation is found. As they eat the decaying matter at top they leave their rich worm castings below for plant roots to feed upon. The worms never get moved around to different levels. They never travel up or down. They stay right where they like it in nature's own continuous flow through bins around the world. No matter what worm bin you use, it really is all about the worm. The food is introduced at top while worms can be found just under this top layer where it's cool, dark and moist. As you add food on the top, you also collect worm castings from the bottom. If you add 2 inches of food on top and take 2 inches of castings from the bottom then your worms will not have moved up or down. They stay right in their comfort zone undisturbed. These worms systems are a worm castings assembly line. Continuous flow through bins are just like Henry Ford's "assembly line". In his factory, the material came to the workers and they assembled it. They didn't have to search high and low for their materials and each worker stayed at their post. The end result was a great product with less effort in less time. 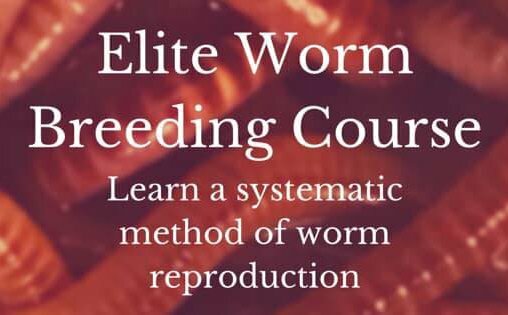 These systems are easier on the worms and the worm farmer. The worms never have to leave way up high or down into the depths of a worm bin wasting valuable time and energy. 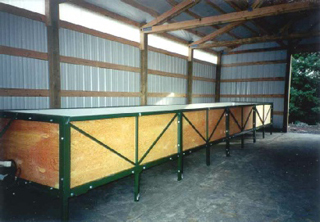 Since the worms are never disturbed, these worm bins will give you maximum productivity in worm castings and cocoons. This is a perfect example of just one of the small scale continuous flow through bins that's been gaining popularity since its inception in 2017. 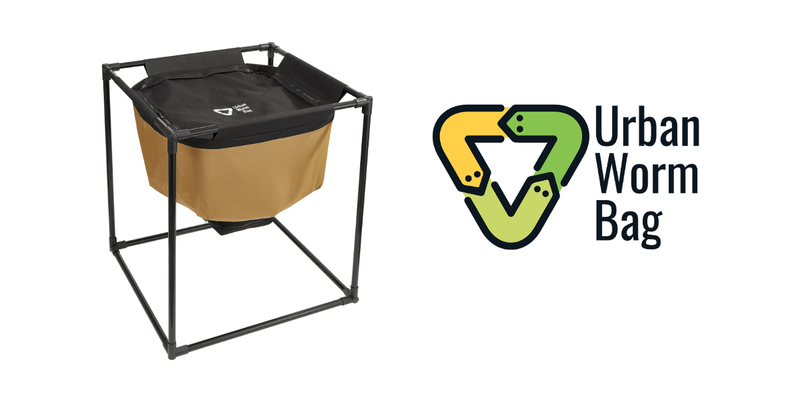 Now it's one of 2019's hottest worm composters. Like explained above, the process is simple. Food is placed at the top and worm castings are collected from the bottom. It has a zipper underneath to keep the worm castings and compost from falling out. 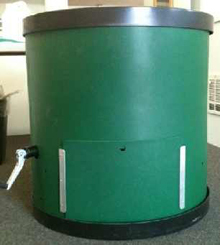 You can place any container you want underneath to catch any leachate that may seep through. You should not have any dripping out but sometimes it depends on the type of worm food you're using like melons and other juicy fruits. If you're looking for something attractive for indoors (unlike a plastic homemade worm bin) the Urban Worm Bag might be something you'd be interested in. 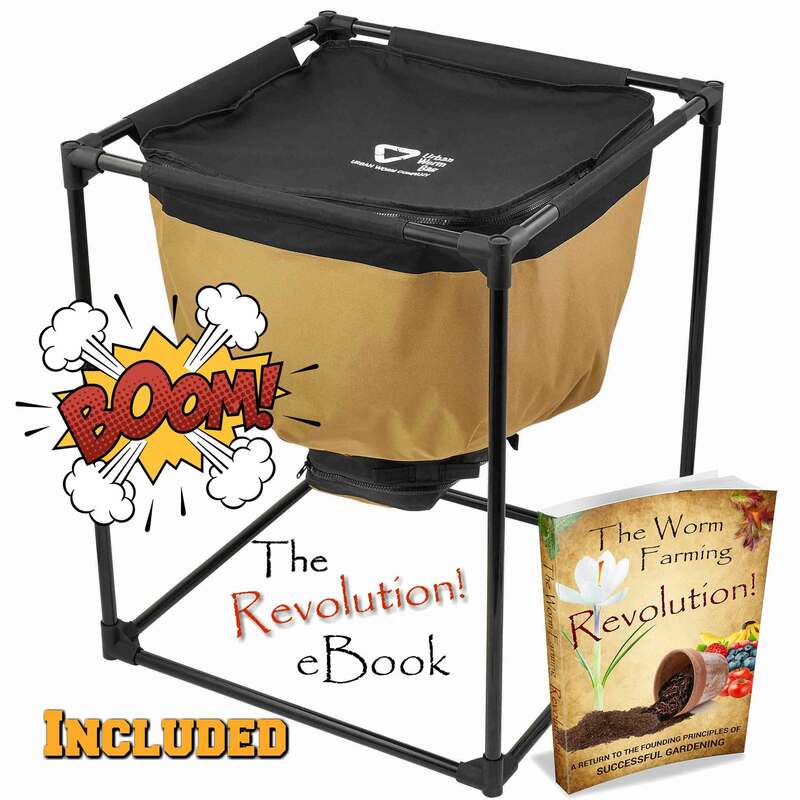 I also own 2 of these and will throw in my free 270 page eBook, The Worm Farming Revolution, if you get an Urban Worm Bag through my affiliate link at The Urban Worm Bag website (not Amazon). Every type of worm bin has a purpose and this bin may not be for you or what you're trying to accomplish, but if you're looking for a worm system that doesn't require moving a bunch of pieces around and is as easy as getting ice out of an ice dispenser, you gotta get the Urban Worm Bag. The Urban Worm Bag is a continuous flow-through model that gives many systems like it, a run for their money. This is fairly new to 2019, but hit the market in late 2017. It's just now gaining momentum and rightly so. This worm system is a valuable asset to those who have large gardens or a community garden or community recycling program of some sort.. Process 40-60 lbs. of worm castings per week and house 40,000 worms. Notice the white crank at the lower left of the picture. This moves a bar around at the bottom of the system like the hand of a clock. It's able to be placed indoors or outside out of the sun and extreme elements. It is insulated, heated and needs a 4' X 4' working space. It also comes with a 3 year warranty. This is a bit pricey ($500-800) and the price changes so they do ask you to call for current pricing. With that being said, I would bet that the Worm Inn would give it a run for its money. If you were to spend as much money on several Worm Inns vs 1 Worm Wigwam you may end up with more worm castings from the Worm Inn. The only problem would be trying to oversee several units at once. how many units would it take to equal a Worm Wigwam? I'd be willing to find out because I would just LOVE to own a Worm Wigwam. These worm bins aren't cheap by any means. Even if you were to build one yourself. However, with a little bit of creativity and ingenuity I bet you could pull it off yourself. Here's the dirt on these worm systems. It's a much larger container and usually squared or rectangular. At the bottom is a metal grid system to keep the worm castings in place. When the worm castings are dry enough to harvest a bar runs along the bottom of the bin scraping across the castings and causing them to fall to the ground, on a conveyor belt, or into a catch-all pan. You can lift the lid (most don't have any) and put more food in at the top of the bin and then wait till the bottom is ready for harvesting again. Just like all continuous flow through bins we've been discussing. So, again, the worms always stay in one spot at the top just like in nature and it's the food source that moves ever so slowly and unnoticeable to the worms. You see how it just keeps getting easier and easier. These worm systems are by far hands down the simplest, most productive, most efficient, less maintenance, least disturbed, and most profitable systems around. If you can master a plastic bin than you can master any setup. If you ever decide to go big in worm farming, then you don't necessarily need all the bells and whistles like the reactors. I know people doing large volumes just out of plastic bins, tubs, and buckets. One company uses over 1,200. Below is a video of a flow through reactor at the Worm Power Facility. I was pretty amazed at the process. In closing, I would like to say that whatever worm system you choose, like a plastic Rubbermaid, a flow through bin, or the continuous flow through bins, I want you to keep 5 principles in mind. Please, If you remember anything at all from this guide then remember these 5 fundamentals. Five Step Success To Worm Composting Page. Practicing with a homemade Rubbermaid is a great idea, but not absolutely necessary. It will set you up to be able to handle almost any type of worm system you can imagine. I hope this worm guide has encouraged you to take the next step in getting closer to a healthier and better gardening experience or maybe you just want to recycle. Either way, I hope you will also share your worm farming experiences with me. Thank you for giving me the opportunity to help teach, inspire and empower you to become the best worm farmer you can be. 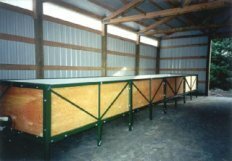 Would you like to build one of the continuous flow through bins yourself? Before you click on the picture or link to see Brian's plans, let me first tell you about Brian. From time to time, I meet like-minded people in many different fields. I watch them, listen to them, and then wait, wait, & wait. When I see that their actions match their words and that others benefit from their advice, that's when my suspicion turns into a confirmation which turns into a vote of confidence. Brian has been interested in worms since 2001 and really knows his worm stuff. From one worm pro to another, Brian has my full endorsement and his "Beast" plans will make a believer out of you too. You can rent the plans or buy the plans and videos. He's put a lot of hard work into this, but I can honestly say that he devotes more time (outside of his website) to help others than he does himself. Get The "Beast" Plans Today!